In few weeks, first samples of NVIDIA’s new GPU architecture (Kepler) will be released. This is the perfect moment for reviewing an ultra high end GTX 580. EVGA’s GeForce GTX 580 Classified Ultra is one of the best GTX 580 out there. Like ASUS’s Matrix GTX 580, this card has no limit, especially regarding the OCP (over current protection). With a regular GTX 580, if you launch a stress test app like FurMark, the couple NV driver + hardware monitoring limits FurMark action by drastically decreasing the GPU clock (by 50% or more!). With the Classified, you can just forget that limitation. This GTX 580 Classified Ultra comes with a very strong power circuitry made up of 17 phases: 14 for the GPU and 3 for the memory and PLL. This 17-phase VRM can deliver up to 1000W! And like the Matrix GTX 580, this GTX 580 Classified can run FurMark at full speed, without throttling! The reference GTX 580 has a GPU clocked at 772MHz. 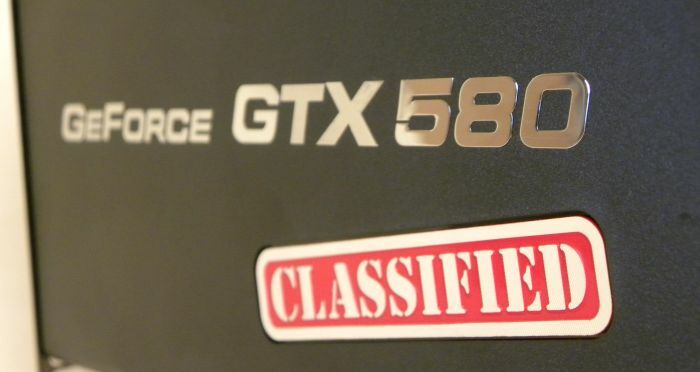 The regular GTX 580 Classified has a GPU overclocked at 855MHz and the new GTX 580 Classified Ultra comes with a 900MHz GPU! EVGA has picked up the finest GF110 GPUs to make this crazy board. Uhmm my 2 GTX 580 (model 1580 reference design) have a higher ASIC quality: 80.5 and 76.5 ! They are also stable at 920 but 910 seems better to me.